ADT President of Dealer Partnerships Joe Nuccio has acquired and integrated more than 275 businesses. If anyone knows how to grow a security company through acquisitions, it’s a veteran like Nuccio. Discover his keys to success and how they can help your business grow. 2018 got off to a roaring start in the merger and acquisitions (M&A) department. We witnessed over 24 M&A transactions in the first three months alone. So what gives? company was acquired by Apollo Global. If anyone knows how to grow a security company through acquisitions, it’s a veteran like Nuccio. 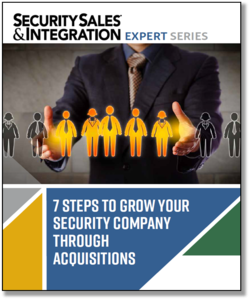 In our new guide “7 Steps to Growing Your Security Company Through Acquisitions,” Nuccio provides tips to help security integrators like you grow through acquisition. Despite what you might think, growth through acquisition is not a one-size-fits-all proposition. In fact, there are a number of strategies you can leverage to customize an acquisition plan that fits the unique profile of your business. Whether it’s growth by acquiring other companies, expanding reach into new markets, or enhancing vertical markets, “acquisition” may mean something different to everyone. Regardless of your particular strategy, growth through acquisitions is a way to catapult your business to a new level. How to best expand your business into new territories to grow your internal sales. How to expand your portfolio by focusing on your company’s strengths and choosing products that elevate your brand. About the importance of merging cultures when blending organizations through acquisition. How to develop a successful cash-flow formula for making account-only acquisitions work best for you. How to leverage the different acquisition methods strategically so you have a plan that is customized for your business. Download our guide to get additional tips to help you grow your business!